Home / chrome / chromebook / eduwin / extension / GAFE / screencast / Screencastify: A Quick and Easy Screencasting Solution for your Chromebook! 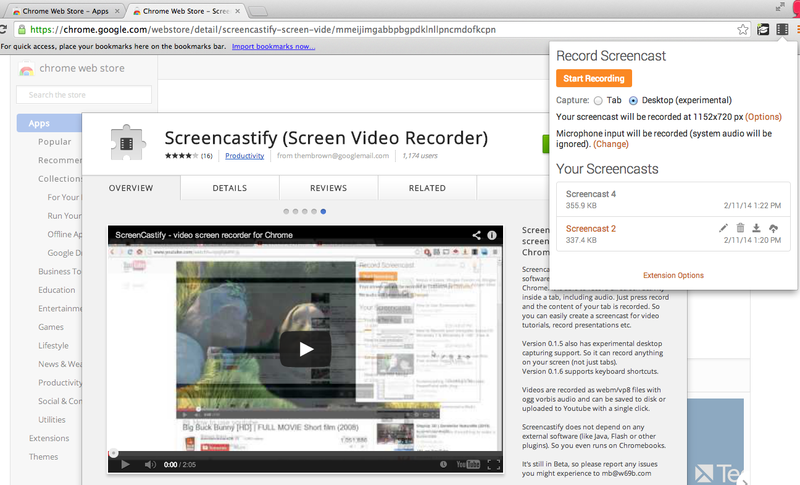 Screencastify: A Quick and Easy Screencasting Solution for your Chromebook! To completely negate my previous post about the nonexistence of Chromebook screencasting solutions, I have since found a fantastic little extension called Screencastify. This is EXACTLY what I've been waiting for since discovering that the only way to do a screencast on a Chromebook is to have a solo Hangout on Air. Screencastify has the ability to record a tab or the entire desktop. The Record Desktop feature works cross-platform: Windows, Mac or ChromeOS. It can also record in various resolutions and with two different audio input configurations: system audio or microphone. When the screencast is finished, it can be renamed and stored within the extension popup window until you download it (as a .webm file), upload it to YouTube or delete it. Best part of all is that it's lightning quick. Now students w/ Chromebooks can quickly capture, narrate and share their learning with you, the teacher! Check out my screencast below and see for yourself!